At Eddy's Mazda of Lee's Summit in Lee's Summit, MO, a division of Brandon Steven Motors, owned by Brandon Steven – we treat the needs of each individual customer with paramount concern. We know that you have high expectations, and we aim to meet and exceed those expectations at our Mazda Dealership near Kansas City. Allow us to demonstrate our commitment to excellence! When you visit us looking for a new Mazda sedan or SUV, our team is here to help make sure your experience is easy and enjoyable. Not only does our dealership offer an extensive selection of new and used Mazda vehicles, but our team is also knowledgable in all things Mazda. Therefore, we can help you find the right vehicle that perfectly fits your needs, wants, and lifestyle. Our attention to your auto needs doesn’t stop after we hand you the keys. The team at Eddy's Mazda of Lee's Summit’s service center is made up of highly-trained, certified technicians that know your Mazda vehicle through and through. Using genuine Mazda parts, our team can perform a wide range of repairs, including brake fluid replacements and tire changes. Kansas City drivers can also come to us for the regular maintenance that keeps their Mazda in top condition, including oil changes, tire rotations, and wheel alignments. 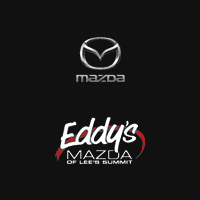 From picking out your new Mazda vehicle to everything that comes after, Eddy's Mazda of Lee's Summit is here for every step of your auto journey. Visit our dealership in Lee's Summit or contact us with questions! You can rest assured that you’re getting the best deals at Eddy’s Everything. We can give you a lot of reasons to choose Eddy’s Mazda as your Mazda Dealership in Kansas City. Here are 5 reasons, just to start. New & Used Vehicles Covered For Life! Always working to get you the lowest price, that is how we get the deal done! One of the highest rated Mazda dealerships in Kansas & Missouri! Being a part of a top dealer group, Eddy’s is able to find you better rates and lower monthly payments by being partners with 30+ banks! No social security? No problem! We can also get you approved with just an I 10! Focusing on the details of your shopping needs, so you can truly have an amazing car buying experience! Plus applicable taxes. Valid only at EDDY'S MAZDA OF LEE'S SUMMIT. Cannot be used with any other applicable offer. Mazda vehicles only. Prices may vary by model. Hazardous waste fee if applicable. Please present coupon at time of write-up. Coupon expires 07/07/2019. Your Genuine Mazda battery is a key component to your vehicle’s overall reliability and performance. For peace of mind, come in today and have one of our technicians install a new Genuine Mazda battery. Don’t wait until it’s too late. Receive a discount on any Genuine Mazda Parts purchased through our retail parts department.Take advantage of this 10% off special today. A. Excludes select components, call dealer for details. Performance starts from the ground up. tires. Wheel balance not included.